Not to be outdone by Ambam, the UK gorilla who became a YouTube sensation for walking upright, Mahale is the latest gorilla to strut his stuff. And, although he's smaller than the competition, he definitely has more swagger. 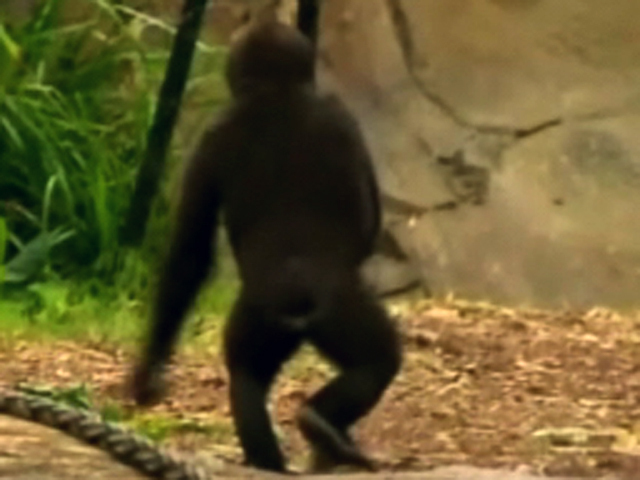 Mahale is a two-year-old, Western Lowlands gorilla that surprised crowds at Australia's Taronga Zoo on Friday, by standing up and walking on his hind legs. According to gorilla keeper Laura Fidler, his human-like behavior is nothing new. In fact, Fidler said that she was "surprised at how often Mahale does it. He seems to do it all the time." While all gorillas and many other primates have the ability to walk upright, most don't. Both Ambam and Mahale are endangered Western Lowlands gorillas.